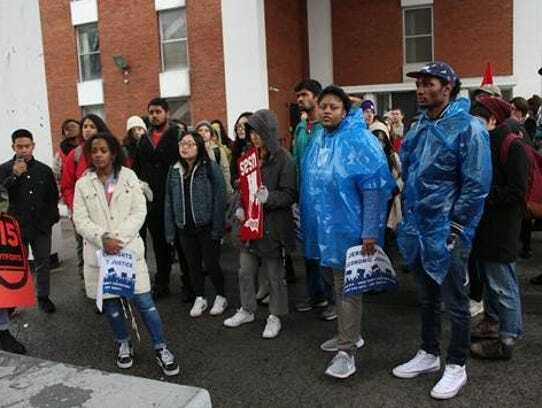 NEW BRUNSWICK – Student groups and unions are planning a protest at Rutgers University, calling for a $15 minimum wage for university employees. On Friday, Feb.23, student groups, a coalition of Rutgers unions and representatives from campuses across the nation will hold a rally and march at Rutgers-New Brunswick. The action, initiated by the Rutgers chapter of United Students Against Sweatshops (USAS) and the Rutgers American Association of University Professors — American Federation of Teachers (AAUP-AFT), will call on the Rutgers administration to establish a $15 minimum wage for all campus workers and to bargain in good faith with Rutgers unions representing 20,000 workers at the university. The event is set to begin at 1 p.m. at Brower Commons, 145 College Ave. The action comes as two national convenings will be held at Rutgers addressing the challenges facing campuses and communities, and strategies for building stronger unions and stronger community-based alliances. USAS, a national student labor organization fighting for workers’ rights with locals on over 150 campuses, will hold its national conference at Rutgers from Feb. 23 to 25. Additionally, the Bargaining for the Common Good in Higher Education Convening, a national coalition of labor and community groups that develops approaches to transform contract negotiations into broader community fights, will be gathering at Rutgers from Feb. 22 to 25, according to the release. “Our union has adopted a practice known as ‘Bargaining for the Common Good.’ What this means is that unions should fight not only for their members but for the well-being of all N.J. residents,” said Deepa Kumar, associate professor of Media Studies and president of Rutgers AAUP-AFT. “Concretely, this means that we have partnered with student groups to first push for a $15 minimum wage for all campus workers and then to advocate for the same across N.J.
Kumar said that the groups also are working with unions that represent the medical schools in hopes that both win healthcare for adjunct and part-time lecturers and reduce the costs for other union members. “Everything we propose will strengthen Rutgers as a public university and as a vehicle for the economic and political enfranchisement of all New Jerseyans,” she said. Rutgers AAUP-AFT has joined with the 25 other unions representing workers across the university. The contracts for these nearly 20,000 workers are set to expire June 30. Rutgers AAUP-AFT has released a bargaining platform that addresses equity, job security, gender and race equity, affordable healthcare and education, and academic freedom. The demonstration comes as the Supreme Court prepares to hear arguments in the Janus v. AFSCME case, which focuses on an Illinois man wishing to opt out of his union fees, and will be a part of nationally coordinated actions by workers and their allies to stand up for strong unions. “Access and affordability for all students is a top priority at Rutgers University. Knowing that more than 13,000 of our students work many hours each week on our campuses to defray education costs, President Barchi increased the minimum wage for student workers employed by Rutgers on all campuses from $8.44 per hour to $11 per hour, effective Jan. 1, 2018. The University will continue to work to keep tuition increases at a minimum while seeking new ways to support students as they pursue their degrees. “All issues related to employee contracts will be discussed at the negotiating table with the appropriate bargaining team representatives from the administration and the unions.